Yesterday I got an assignment back and I got a 9 out of 10. That is a pretty decent score as far as grades go, especially since there are tons of points in the class and assignments like this one are only worth 15% of the grade. Alas, I still fought for that point, because my work was done correctly and I deserve to be compensated correctly for the time and effort I put into my work. 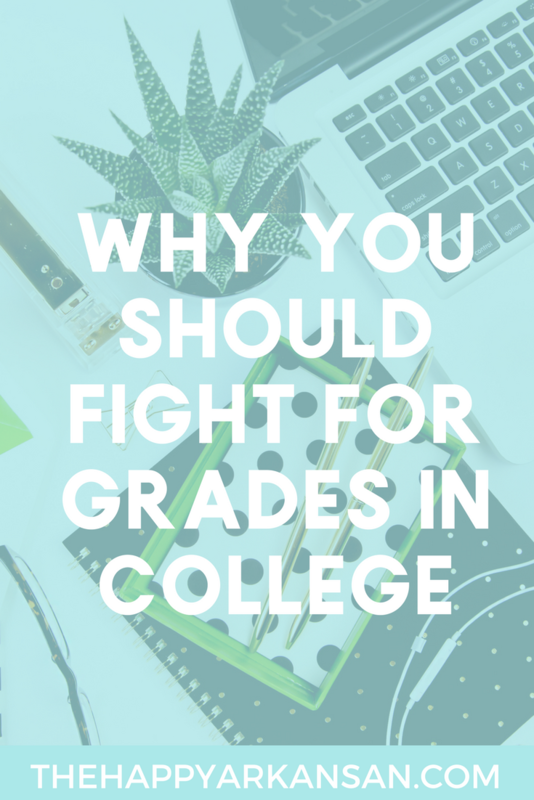 Today on the blog I am talking about a sore topic for many college students–fighting for the grades they deserve. Thankfully, this wasn’t much of a fight. The professor was very nice about the mistake and fixed it right away when I showed him the evidence. In high school, a point or two often seemed petty to argue over. People often looked at people who got high scores and scoffed at them when they went to inquire about a potentially higher score or an answer that was incorrectly marked wrong. I have to say that I used to be one of those people as well. I used to think this was quite petty and that in the bigger picture these things shouldn’t matter. That was until last semester. Last semester I took a class and on quite a few of the earlier assignments I got grades like 48/50. At the moment these were great grades. I mean, that’s a 96%. I didn’t feel any emotion about these grades until the end of the semester when I ended up with 880-something points out of 1,000. Essentially I ended being just a few points away from being rounded up to 900 points (and therefore an A in the course). After the final grades came out, I, of course, racked my brain and wondered what could have been if I had challenged these points when they happened. So today, I stand, a changed person. Your grade in college is your livelihood. Your grade is so important to so many aspects of college life, your GPA, scholarships, etc. Sure, a few points here and there might not matter much at the moment, but looking back you could end up with the short end of the stick because you didn’t stick up for yourself. When it comes to grades in college it is often about more than just one or two points Here are my tips for dealing with grade disputes and actually fighting for the grades you deserve in college. Professors are by no means perfect human beings. They make mistakes, grade while super tired or under stress, etc. Sometimes they don’t even grade the papers or enter them into things like BlackBoard. Being a professor is tough work, but it does not mean that you never make mistakes as a professor. Professors are, above all else, human. Sometimes they make a mistake in how the upload a test on BlackBoard, they may take a few points off an essay with little information as to why, or they may be having a rough day and grade horribly because of that. Students often see professors as some sort of strange being. They don’t want to approach them; correct them; or challenge them in any way, shape, or form. This won’t get you anywhere in the long run. You have to be willing to stick your neck out, because if you don’t fight for you, no one will. It’s so easy to go straight into blaming the professor when something goes awry, especially on a paper or something that is graded more subjectively. Make sure that before you approach your professor you are completely in the clear. As for what happened to me yesterday my professor wrote that my margins looked big. I knew that I hadn’t changed any of my margins from the normal ones and that they were the same that they’d always been on prior assignments. I still made sure that I was actually in the clear. I pulled up my written assignment and checked that the margins were in fact where they were supposed to be. In certain situations where you are near your professor soon after they give you back your assignment, it is so easy to just talk with them right away. I would say that if you can give yourself a few minutes to calm down and talk through the situation in your head do so. You never want to come across as angry or disrespectful. More likely than not it was an honest mistake. Giving yourself time to calm down and talk through ideas about what to say in your head is the best way to calm down. Listen to a song you love or look at a picture of your dogs. Whatever calms you down always helps out big time. This is so important during the actual talk with your professors. Some professors are going to be so much easier to talk to. In my case, it was a breeze to mention the grade and get it corrected. Sometimes it just won’t be that easy. Be careful of your tone throughout your entire discussion with your professor and don’t accuse them of anything. Talk about your grade in a civil manner because your professors have been in your shoes and they know how difficult it is to approach a professor about a grade or fight for your academic awesomeness. Sometimes things just won’t work out and approaching your professor about something won’t work as well as you’d hoped. There are other people you can talk to above your professor, but always go to your professor first. If you know someone who works above your professor it can be so easy to want to go directly to them, but there are particular people you need to address first. Always follow the chain of command because that will get you farther in the long run (plus when you talk to the person you do know you will have proof that you talked with all the other people involved.) This article called 5 Steps To Resolve Your Grade Dispute offers some great tips on this very subject. Sometimes you can easily say this is the reason that this point was marked off my paper. In the case of the point that I argued for yesterday, I knew that the margins were basically the sole reason that something was taken from the grade I got. Oftentimes it’s not very clear why exactly points were taken off your paper. In this case, and what I wish I would have done in my class last semester, is ask how I can improve so I get more 50/50s. Obviously, if you are consistently getting a 48/50 there is something small you can probably do each time to make sure that you are getting all the points possible. This is so important at the end of the year when you might need those couple of points for rounding purposes. This is a great way to discuss things with your professor when you aren’t sure why points were deducted and to take the blame off of them and put it on you. Remember, you never want to accuse your professor of doing something, it’s just not professional. Grades sometimes get lost in the shuffle. Your professor will probably do all that they can to make sure that doesn’t happen, but sometimes an assignment grade is lost or a professor forgets to mark someone on the attendance sheet. Things happen and you need to be prepared for those things to happen. It is important that you are diligent about keeping up with your own grades and not trusting that the professor will keep up for you. We all want to throw away our assignments as soon as we get them, but that’s just not smart behavior. You don’t have to keep them in your school binder or folder, but make sure you have some sort of filing system so that you can keep up with graded work at least until the end of the semester. This paper trail is great in case you need to prove a grade or prove that you turned in an assignment. Have you ever disputed a grade on an assignment? I’d love to hear your thoughts. Would you ever fight for a point or two extra on an assignment? Continue this conversation with me in the comments below! I recently received a mark back for my final essay and was totally bummed out when I realised that I had only received a 55%. Especially since I knew that I had spent hours upon hours on that assessment to make sure that it was as well done as I could make it. I booked an appointment with my tutor a week after we received that marks to ensure that I gave myself enough time to go through the essay and consider what her feedback told me – the problem was, there was barely any feedback. After talking to her, and having her go through my essay another time, she raised my essay mark to 65% (a credit) which truly astounded me. It just goes to show that talking to your professors/tutors can go a long way!